The compact design with a built-in quick-fitting joint makes flexible layout possible. The regulator comes with a relief mechanism that facilitates adjustment of devices. 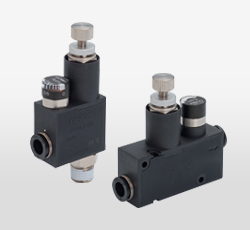 The compact regulator is best suited for use with a manifold type solenoid valve. Miniture pressure gauge mounted models are also available.